If you are anything like me and ate WAY too much at yesterday's BBQ, and the left overs only remind you of how much you shouldn't have eaten, then this recipe is for you! A crisp light salad, good anytime of the year. 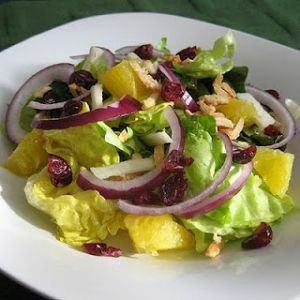 This can also be altered to include your left over grilled chicken or other meats for a more hearty salad. Serve tossed with orange dressing and sugared almonds. Place almonds in a small skillet and sprinkle with sugar. Cook over medium heat stirring until almonds are coated and starting to brown (a nice tan color) and sugar has dissolved. (Be careful not to burn) Allow almonds to cool.